Ice ages have been linked to the Earth's wobbly orbit—but when is the next one? Over the last two and a half million years the Earth has undergone more than 50 major ice ages, each having a profound effect on our planet's climate. But what causes them and how do we predict when the next big ice age will hit? About 40 years ago, scientists realised that ice ages were driven by changes in the Earth's orbit. But, as I recently argued in Nature, it's not that simple. Scientists are still trying to understand how such wobbles interact with the climate system, particularly greenhouse gases, to push the planet in to or out of an ice age. During the last ice age, only 21,000 years ago, there was nearly continuous ice across North America from the Pacific to the Atlantic Ocean. At its deepest over the Hudson Bay, it was over two miles thick and reached as far south as what would now be New York and Cincinnati. In Europe, there were two major ice sheets: the British ice sheet which reached as far south as what would now be Norfolk, and the Scandinavian ice sheet that extended all the way from Norway to the Ural mountains in Russia. In the Southern Hemisphere there were significant ice sheets on Patagonia, South Africa, southern Australia and New Zealand. So much water was locked up in these ice sheets that the global sea level dropped by over 125 metres – around ten metres lower than the height of the London Eye. In comparison if all the ice on Antarctica and Greenland melted today it would only raise sea level by 70 metres. So what caused these great ice ages? In 1941, Milutin Milankovitch suggested that wobbles in the Earth's orbit changed the distribution of solar energy on the planet's surface, driving the ice age cycles. He believed that the amount of incoming solar radiation (insolation) just south of the Arctic Circle, at a latitude of 65°N, was essential. Here, insolation can vary by as much as 25%. When there was less insolation during the summer months, the average temperature would be slightly lower and some of the ice in this region could survive and build up – eventually producing an ice sheet. But it wasn't until 30 years later that three scientists used long-term climate records from analysing marine sediments to put this to the test. Jim Hays used fossil assemblages to estimate past sea surface temperatures. Nick Shackleton calculated changes in past global ice volume by measuring oxygen isotopes (atoms with different numbers of neutrons in the nuclues) in calcium carbon fossil in marine sediments. John Imbrie used time-series analysis to statistically compare the timing and cycles in the sea surface temperature and global ice volume records with patterns of the Earth's orbit. In December 1976 they published a landmark climate paper in Science, showing that climate records contained the same cycles as the three parameters that vary the Earth's orbit: eccentricity, obliquity and precession (shown in Figure 1). Eccentricity describes the shape of the Earth's orbit around the sun, varying from nearly a circle to an ellipse with a period of about 96,000 years. Obliquity is the tilt of the Earth's axis of rotation with respect to the plane of its orbit, which changes with a period of about 41,000 years. Precession refers to the fact that both Earth's rotational axis and orbital path precess (rotate) over time – the combined effects of these two components and the eccentricity produce an approximately 21,000-year cycle. The researchers also found that these parameters have different effects at different places on our globe. Obliquity has a strong influence at high latitudes, whereas precession has a notable impact on tropical seasons. For example precession has been linked to the rise and fall of the African rift valley lakes and so may have even influenced the evolution of our ancestors. Evidence for such "orbital forcing" of climate has now been found as far back as 1.4 billion years ago. However, the scientists realised that there were limitations and challenges of their research – many of which remain today. In particular, they recognised that variations in the Earth's orbit did not cause the ice age cycles per se – they rather paced them. A certain orbit of the Earth can be associated with many different climates. The one we have today is in fact similar to the one we had during the most intense part of the last ice age. Small changes in insolation driven by changes in the Earth's orbit can push the planet into or out of an ice age through the planet's "climate feedback" mechanisms. For example when summer solar radiation in reduced it allows some ice to remain after the winter. This white ice reflects more sunlight, which cools the area further and allows more ice to build up, which reflects even more sunlight and so forth. Therefore, the researchers' next step was to understand the relative importance of ice sheet, ocean and atmospheric feedbacks. They discovered that greenhouse gases had an important role in controlling climate. In particular atmospheric carbon dioxide had to be low enough for the planet to start cooling before it could tip into an ice age. So how can all this help us understand future climate? One idea is that small increases in greenhouse gases due to the expansion of agriculture that started 8,000 years ago have in fact delayed the next ice age. What's more, if we continue emitting greenhouse gases at the same rate, we might have put off the next ice age for at least half a million years. If we have merely delayed the next ice age, we will still be in the Quaternary Period – the last 2.58m years defined by the ice age cycles. But if we have stopped the ice ages, humans will have caused a much greater change and so have entered the Anthropocene period as some argue. If I had to put money on it, I'd say the Earth has experienced its last ice age for a very, very long time. Add the factors of impacts and volcanism to the mix and holes in the Milsnkovitch cycles might be filled better. In the meantime, throw another log on the fire and appreciate the warmth. Author had me worried there for a minute: I thought he might have the temerity to suggest climate cycles are driven by larger forces than Man. Career suicide to do that. Looks like Global Warming will balance out this new threat. ......that's for sure, the last thing 8 billion people need is another Ice Age covering most of the northern hemisphere's cropland areas creating massive famine..........whoops, wait a minute, isn't that what some......? Re-read, or perhaps better advice would be to get an education. Perhaps you're one of the lucky ones, and education might actually penetrate. More fodder for the hungry ignorant Chicken Littles from their AGW Cult and their Pathological "science". Gobble up. Scientists also note that geologically speaking, the Earth is currently in a "CO2 famine" and that the geologic record reveals that ice ages have occurred when CO2 was at 2000 ppm to as high as 8000ppm. In addition, peer-reviewed studies have documented that there have been temperatures similar to the present day on Earth when carbon dioxide was up to twenty times higher than today's levels. However, the scientists realised that there were limitations and challenges of their research – many of which remain today. In particular, they recognised that variations in the Earth's orbit did not cause the ice age cycles per se – they rather paced them. Right so the question is what is the cause? 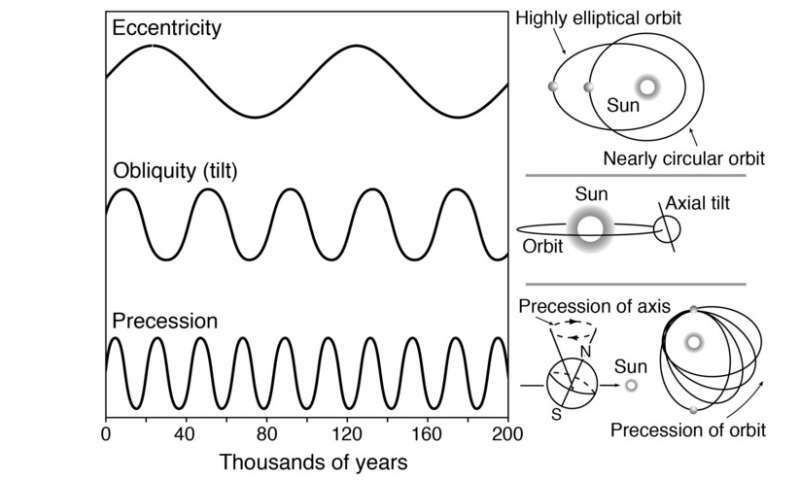 There are only a few things that come to my mind that are potentially cyclical enough to cause such a repeatable pattern in the Quaternary Period: Supervolcanoes, Solar cycles, ocean currents, celestial impacts. Nice to see people using my art, however, please credit my real name rather than my screen name thanks. The hint that humans may have been causing global warming for the last few thousand years if quite an interesting one. Also that the current carbon emission rate may cause Earth to finally swing out of the current ice age. We can theorize all day long about why we are in an ice age. I come from the biology side of things so my personal feeling is that plants are the cause. They are getting too efficient at carbon capture and that the glacial-interglacial cycles are being caused by gymnosperms working in sync with solar cycles to sequester and release CO2 over long periods.